There are a lot of different casein protein powders to choose from in the marketplace and as such it is important to understand what protein is going to be the best fit for what you are trying to achieve. Having the right kind of protein to supplement your diet can help you to not only lose weight, but also build muscle at the same time. As you will already know, protein is one of the key ingredients to building and repairing muscle. Without the right protein, you can lift weights as much as you like and not build muscle. Timing can also play an vital role in building muscle mass, but trying to get enough protein in during the day can be a little challenging at times, which is why a good protein supplement is needed. This article discusses some of the best casein protein powders on the market in 2018, so you can choose which is going to be the best fit for your workout and recovery. These products were chosen based on the feedback from verified purchasers worldwide. Protein can aid in fat loss and muscle gain depending on how you want to use it. Whether your goal is for weight gain or weight loss there is a solution that will fit your budget. Most folks tend to use Casein protein powder at night before bed so that it continues to supply their muscles with a steady stream of amino acids while they’re a sleep. This creates the best environment for building muscle, because your body is in repair mode while you’re a sleep. So Casein is able to supply your body with all the nutrients it needs to build lean muscle throughout the night. One of the biggest problems that most folks say about casein protein powder is that it can be difficult to drink especially if it has been sitting for a few minutes. Primarily because it starts to thicken up, and the longer you leave it, the more gluey or gluggy it gets. Now, this isn’t a problem if you like a somewhat thick shake, but to some it can be a little difficult to drink. So the cool thing about optimum nutrition Gold Standard Casein is that it thickens when it hits stomach acid, which means that it can help to make you feel fuller, for a longer period of time. Most whey protein shakes tend to be a little thin, which feels a lot like drinking milk. But if you like the feeling of being full then this casein protein might be what you’re looking for. It’s best to take it at night before going to bed, so that you’re not going to bed feeling hungry. Apart from feeling hungry, it does serve a purpose in that it will slow release amino acids throughout the night for a longer period of time than your ordinary whey protein, which means that your muscles with get a steady flow of amino acids while you sleep. Click here for Optimum Nutrition Gold Standard Casein discounts and customer reviews. It is a blend of whey, isolate, casein, and egg albumen. Which means that you can drink it at anytime during the day and also before bed. Because it is a blend you’ll find that the consistency might be easier to mix, although a number of customers say that it is still best to use a blender or else you could end up with chunks. If you’re looking for a slow release protein but don’t like having lots of different types of protein powders taking up your shelf space then this could be a good solution as it gives you the best of both worlds, the benefit of Whey as well as the slow release of casein. There have been a number of mixed reviews, where customers have said that the products taste too sweet. It’s great if you have a sweet tooth, but not so if you don’t. 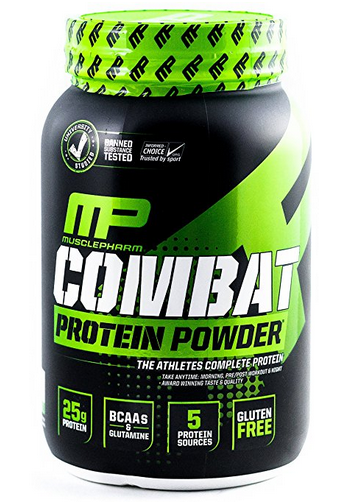 Click here for MusclePharm Combat discounts and customer reviews. The taste and consistency of Dymatize Nutrition Elite casein appears to be quite good across the board. Like most of the other casein protein products there are some good and bad reviews on the taste an consistency however, the majority of the reviewers tend to be positive. One thing that seems to be consistent with a lot of the reviews is that it’s always a good idea to experiment with different forms of liquids and blending methods. Some folks say that milk makes the protein taste a lot better while others blend it with ice and some even add a table spoon of peanut butter. Click here for Dymatize Nutrition Elite Casein discounts and customer reviews. The casein protein by Universal Nutrition is one of the best tasting casein protein we have seen. The taste of the product is second to none and if you like chocolate and peanut butter then you’re in for a treat. This protein blends well with a variety of different liquids, such as milk, almond milk, low fat milk and even water. If you’re not used to the consistency or taste of casein protein then this might be a good place for you to start, because it has been one of the better brands of casein proteins we have reviewed and what we have observed from other people who have purchased the product. Click here for Universal Nutrition Casein discounts and customer reviews. If you’re not used to the taste and the consistency of casein protein then the MuscleTech Platinum casein protein powder may not be a good fit for you. Whilst it may contain a higher percentage of protein per scoop than some of it’s competitors it may also be a lot harder to drink. Some reviewer say that if you leave it to sit for a while after you have mixed it up with your favorite liquid (like milk, almond milk or water etc) it can really thicken up making it difficult to drink if left too long. Of course, you want it to thicken up so as to help you feel fuller longer, but not so much that it’s hard to drink. If this has been a problem for you in the past then you should consider using Optimum Nutrition Gold Standard 100% Casein as it has the consistency of whey protein and only starts to thicken up in the presents of stomach acid. Click here for MuscleTech Platinum Casein discounts and customer reviews. Milk and dairy products have two main types of proteins in them: whey and casein. “Curds and whey” is a very commonly used phrase that you may possibly have heard, and it refers to these two protein types. Casein is the protein that forms as “curds” or globules, and is used slightly for various purposes. On the other hand, whey protein refers to the liquid fraction that is dried into the common whey protein powders that most people are familiar with. Casein is usually overshadowed by its more popular brother, and can at times go unnoticed by individuals who could be benefit from it greatly. There are numerous reasons as to why people need to take casein and numerous reasons why people should take whey protein, and numerous reasons why people ought to take them both! While whey protein has its place and benefits, there are a host of benefits of using casein protein powder too and we will go over some in the next part before moving further in this casein protein powder review. One of the main functions of casein, as with any protein, is to aid the body in the buildup and repair of muscles. It also plays a very significant role in fat loss. But, there is a small difference in how it gets this important job done compared to the soy, whey, or any other meat or plant based protein. The major benefit of casein is that it is digested far slower compared to whey protein. This therefore makes it an ideal alternative when you are looking for something that will keep you feeling full for longer, or want a protein source, which will provide a sustained release of essential amino acids into your bloodstream when you are sleeping. Not only does this prevent your body from shutting down the vital muscle building process but it keeps your body nourished, and replenishes and repairs the muscles. Always have this in mind when choosing the appropriate time to take your casein protein. Is casein better than typical protein? Yes! Casein takes long for it to be digested, meaning that one feel fuller for a longer time compared to when they have taken typical protein. Casein is also very rich in dairy calcium and this isn’t the case with typical protein. Calcium is essential in the growth and development of bones and teeth. However, typical protein tends to be the better choice when you one is trying to get amino acids into their bloodstream quickly. Aside from that, typical protein is also ideal for people with gas problems as opposed to casein which has a high lactose percentage. Lactose is known to cause bloating and other gas problems as well. As previously stated, casein digests slowly so you need to take that into consideration when deciding when to take it. As with most other supplements, it doesn’t really matter a lot when you take casein, since your body will have to absorb it anyway. However, since casein protein is very slow digested, there are several recommended times during when you can get the most out of it. A few hours before going to work out: It will provide you with nourishment and energy, and can also keep you from feeling worn-out at the gym. Immediately you wake up, and this should be right before taking breakfast. Right before heading to bed: In fact, this is a very appropriate time because your body will be without food for close to 8 hours, and hence some slow digesting protein will do great. Casein is found in milk, (milk is composed up of 20% whey protein and 80% casein protein) thus it is found in any products stemming from that. Here is a quick list of some of the foods that are known to harbor high casein protein content. This is a question that gets brought up many times. Do you require an actual casein powder? Can’t you just get it from the natural sources? The answer is no and yes. It is not all people who need casein protein but there those who should definitely consider it, and who may gain more benefits once they start adding it to their daily diet. If you are an athlete you can greatly benefit from casein, and this ranges from football players, to powerlifters to bodybuilders. If you are engaged in extreme daily physical activities, then chances are that you will definitely benefit a lot from casein protein powder. Individuals who don’t consume enough dairy products can as well benefit from casein supplementation as they are not deriving it from natural resources. Finally, anyone struggling with protein proficiency ought to consider buying casein protein. In fact, if your doctor recommends a protein supplement, then you casein protein can’t go wrong with you. However, if you don’t have any goals in mind, working hard, or training for something then you most probably don’t need it. There is quite a lot of variation in terms of value for money and purity of the casein protein supplements, available in the market today. However, if you put the above considerations into good use, you can be sure that the supplement you buy will deliver a healthy dose of case protein. Have in mind that going for the best supplements doesn’t necessarily mean that you will have to pay more on the basis of dollar-per-pound. The key lies in paying more attention to the additional ingredients that might help things like performance in the gym and digestion, as well as the amount of casein protein in each serving. One of the biggest issues with Casein protein powder is getting a powder that tastes good. Most Casein protein powders don’t mix too readily with water and as such can feel a little gluggy to drink. A part from that Casein powder comes in most standard flavors, like Vanilla and Chocolate. Obviously, there is going to be some debate about which flavor is the best and I think that this is really just personal preference. There’s really no such thing as Casein protein that has been specifically designed for females. But I guess if there was a specific type of Casein protein powder then it would be one that is on the lower side of the caloric chart. Consuming adequate protein is the foundation of keeping lean muscle mass, but so is reducing your overall daily calorie intake. As mentioned previously, there’s no specific Casein protein powder that has been designed for weight loss, however there are certain blends of protein powders that may aid in weight loss. Consuming a powder that is low in carbohydrates would help to keep the calories down as well as keep your insulin level low. There are various blend of both Casein and Whey protein powders out there, and a lot of bodybuilders take a diy approach and blend their own protein shakes. This allows them to get the best of both worlds. They get a fast absorbing protein (Whey) that feeds the muscles immediately and they also get a slow releasing protein that will help to feed the muscles over a longer period of time before you’re next meal. Studies show that calcium taken in conjunction with a high quality protein can actually help you to lose fat. It was found that combining the two ingredients meant that more fat was excreted as a result. Casein protein is a very high source of protein, but on top of that it is also high in calcium you you get the best of both ingredients from one source. So yes, according to this study Casein protein is good for weight loss. Does Casein Protein Cause Weight Gain? This really is a loaded question and as such the answer could go in either direction. Meaning you could gain weight with Casein, if that is your goal, although there are easier and more efficient ways of doing so, or you can take Casein protein and get ripped. So it really depends on what you’re hoping to achieve by using Casein protein. Like any type of food that you ingest, they all have a caloric value associated with it, which means that the more of it you consume over a given period, it can either put you in a calorie surplus or you remain in a calorie deficit. Which simply means, if you eat more than your body requires, then you will store the unused energy as fat, however if you eat less than what your body requires, then your body will burn your fat stores as it’s energy. Therefore, if your goal is to gain weight, you need to eat a surplus amount of calories, but if your goal is to burn fat, then you need to eat less than your body requires. If you’re consuming more calories than you burn, then you will gain weight. So if you added Casein protein to make up your protein requirements for the day, but doing so puts you in a caloric surplus, then you will gain weight. If your goal is to gain weight, then there are a lot of other protein powders that will help you to achieve this goal a lot faster and more efficiently than Casein protein. Casein is usually a type of protein you consume at night last thing before you hit the hay or in between meals. It’s designed to slowly release amino acids throughout the night so that they help repair your muscle tissue while you sleep. So the idea is that you can add Casein to you total macros for the day, but just be sure that you don’t go over your calorie requirement. Does Casein Protein Bulk You Up? Or Is Whey Better? One very common question that I hear all the time relating to casein protein is does casein protein bulk you up. Depending on what your workout and dietary goals are, Casein protein can provide a great way of putting on lot of muscle mass without the excess fat. Having said that, Casein protein can be more expensive that most traditional forms of dietary protein supplements, purely because it’s more costly to produce. Therefore, if cost is a factor, then it’s best to consider using Casein protein strategically if at all, as opposed to a replacement for more conventional protein supplements. Casein should be used strategically anyway, which should coincide with the way it works. Casein is a slow releasing form of protein that is great for a long release of amino acids instead of a quick rate of absorption. This being the case, Casein is best used at night before retiring for the night. It’s slow release means that you can provide essential amino acids to your body in the wee small hours of the morning while you’re a sleep. So does casein protein bulk you up? If your main goal is to just put on size (meaning fat weight too), as fast as you can, then using Whey protein could be the most cost effective way to do this. This isn’t a problem for people who metabolize calories quickly. However, if you want to put on muscle mass without the fat then a better option would be to supplement your diet with Casein. Everyone is different in how they metabolize food, so a skinny guy who has a very high metabolism could find using Whey a more cost effective strategy, because they can burn off any excess fat readily, whilst a person who gains fat easily might be better suited to Casein. Whey protein is a lot cheaper to buy than Casein, so if your calorie requirements are high and you find it difficult to put on weight then Whey might be the better option for you. However, if you calorie requirements are low, say around 2500 – 3000 calories per day, then Casein protein might be the better fit for your dietary requirements. Casein is higher in protein and also has a higher amount of calcium per serve which has been shown to assist in burning fat more readily. So if money is not a problem, then Casein could be the way to go. Try Optimum Nutrition Casein here. If you want to bulk up, then the best form of training with weights is to progressively lift heavy. This will allow for all of your muscle fibers to gradually engage. And because you are consuming more calories than you need, your body will have an excess, which creates the perfect anabolic environment to build muscle. The aim is to keep the reps medium to low and go as heavy as possible. For example : for chest start with a weight that you max on at 15 reps. Then for the next set add more weight so that you max out on 12 reps, then add more weight and max out on 10 reps and so on and so on until you get as low as 6 reps.
Then it’s onto the next exercise doing the same thing.